Lead playing doesn't always have to involve single note melodic runs. You can introduce deeper harmonic expressions by playing around with two or three simultaneous notes over the chord sequence. This lesson is about finding a suitable starting point for building your lead harmony and developing it around some common chord movements. The video below will get you started, and then further down you can grab your practice tracks and learn more about building lead harmony effectively, using the most common scales. Scale harmonization is a great way to explore a particular scale's musical flavour. The concept is simple - instead of playing through the scale note by note, we play through it two notes at a time. Two notes played together on guitar like this is known as a double stop. In the video I showed you the most common scale harmonization intervals - 3rds, 4ths and 6ths. Below I've picked out several scales for you to harmonize. There are tabs below each scale showing you how we could harmonize on a C root, but try and work it out yourself before you jump to the answer! You can then jam out your ideas using the practice tracks below each scale. 6ths are slightly different as we have to skip a string. If you collapse back the finger on the lowest string you can touch and mute the string in between the two notes. When playing over the C major track, listen to how Mixolydian changes the overall colour of the harmony compared to the major scale - even though there's only one note difference between the two scales. I've highlighted the differing harmonies in blue on the tabs below. Switch between the two to really internalize this difference - that's some powerful ear training! Again, just one note difference in relation to the major scale, but with a big change in sound. A very pretty scale to harmonize! This scale is traditionally used in styles such as flamenco and Gypsy music, but you'll also hear it frequently used in pop, rock and especially metal. Great as a more tense alternative to Mixolydian. Most minor key songs fall within this scale. If in doubt, try natural minor (along with pentatonic of course) first! Another common minor key scale that differs from natural minor by one tone (the 7th). Considered a darker sound by many. I've marked the differing harmonies in blue. Tip: great for blues when combined with minor pentatonic and its flat 5 variation. In later parts, I plan to show you how to combine harmonic and melodic movements in your lead playing, right across the neck. 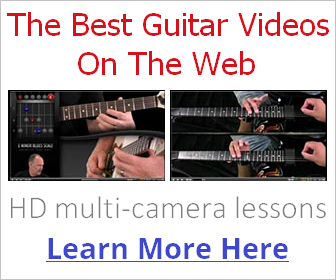 In the meantime, I hope you enjoyed the lesson and the new dimension it offers your lead playing!